So yesterday, on Saturday, thirteen of us gathered at my house at 3:30 for one last look before the big reveal. 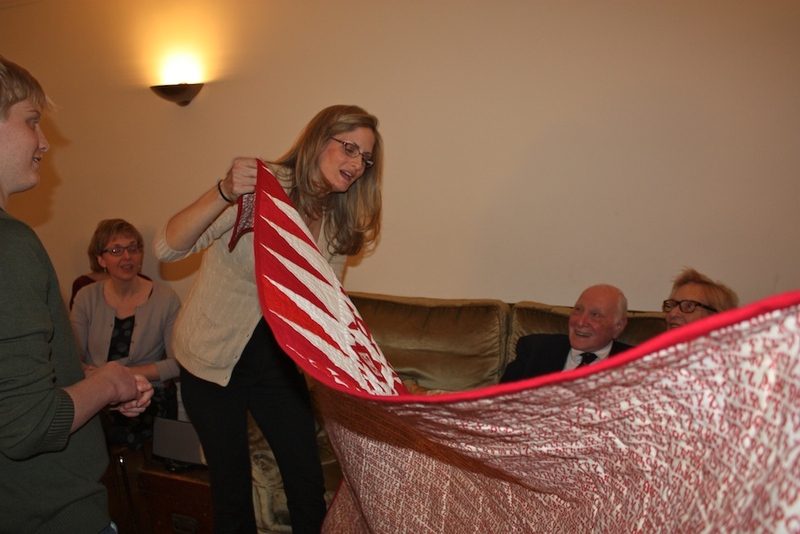 We folded it and put it in the bedroom so as to have a chance to tell the story before unveiling it. My aunt and uncle joined us at 4:00, along with my parents and immediate family. We all watched a slideshow of highlights from Infinite Variety, the show that started it all. 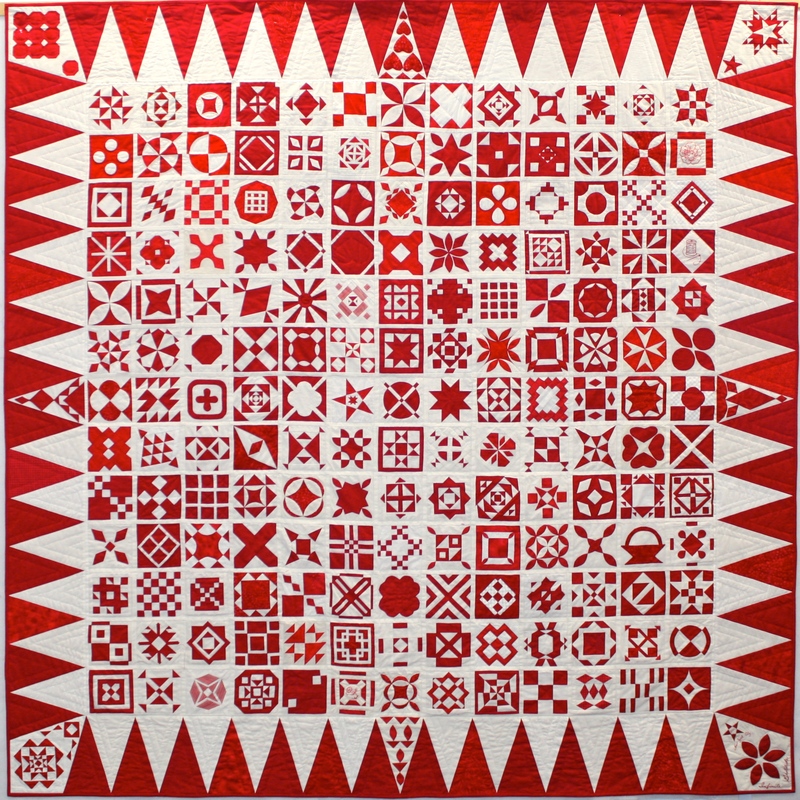 When it was finished, we told them that our thought process went something like “So what can you make for someone who has 650 different red and white quilts?” and that we, as quilters, knew of a quilt design that definitely was NOT in the show: A Dear Jane quilt. 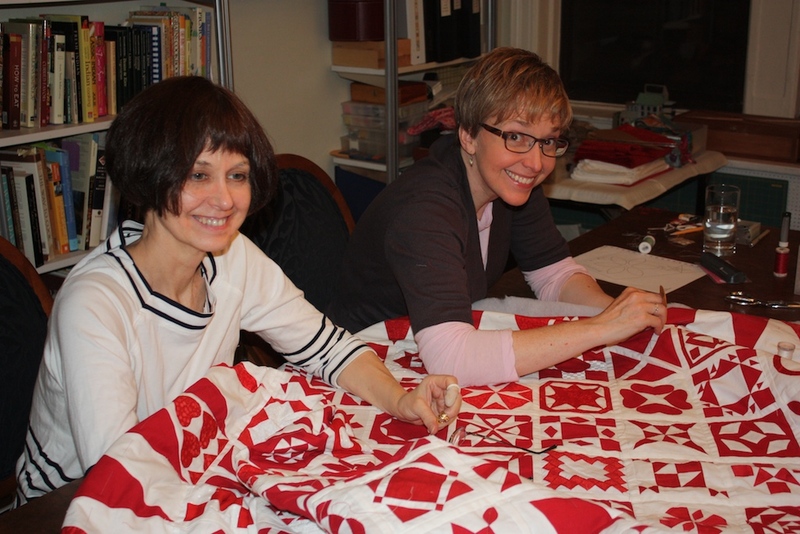 Judy and Diane gave a quick recap of the Jane Stickle quilt’s history, and Brenda’s creation of the book, and how it has become something of a cult project in quilting today. 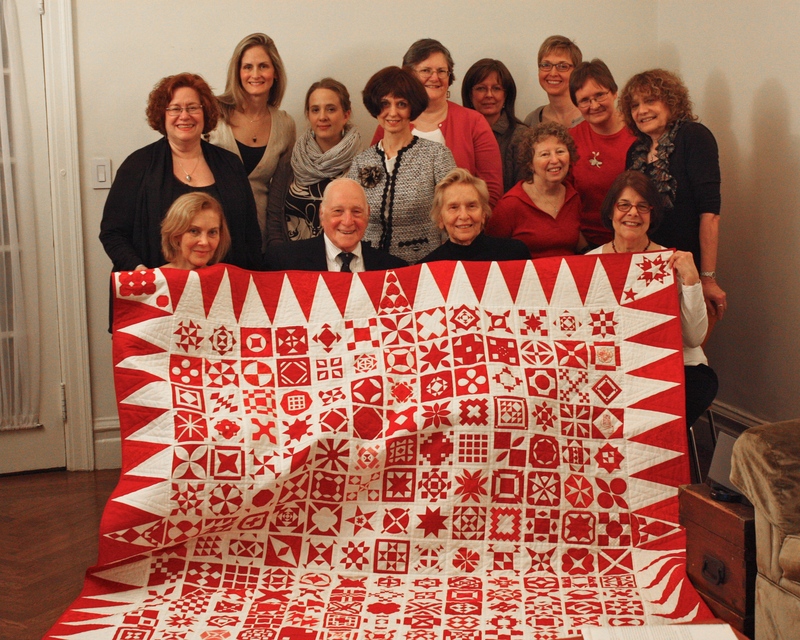 Before unfolding the quilt, we showed them the label, explaining that 35 of us had contributed and how we’d managed to keep it a surprise these past 9 months. It became apparent, after a few minutes, that they hadn’t really understood that we were giving it to them. For keeps. We said again, yes, we made this for you. 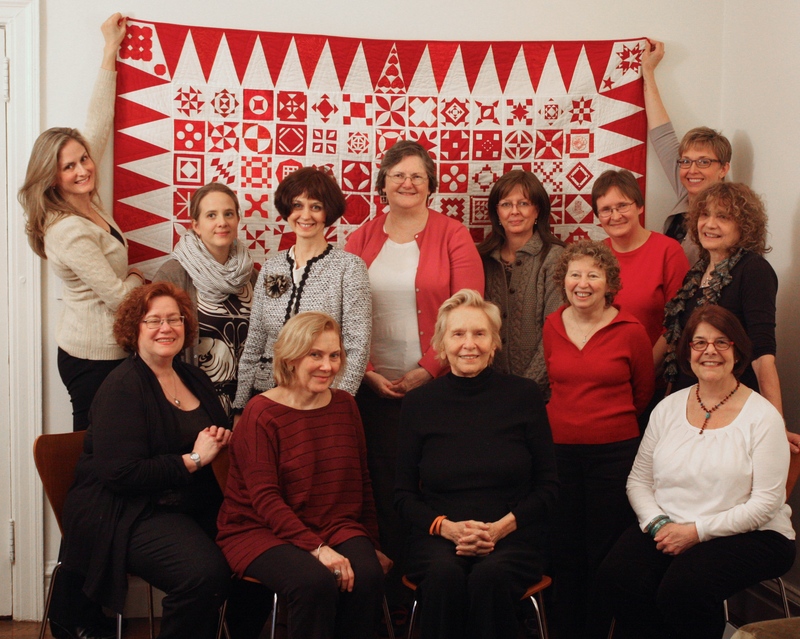 They thanked us over and over, but we just kept saying we made the quilt to thank them. We said that, for our part, we get to keep the experience and memories of having done it together. My brother took group pictures and then we all sat and talked for quite a while, my aunt telling stories about everything from quilts to the time she gave my father a really “memorable” haircut when they were little. I wish each and every one of you could have been there, but you were all with us in our hearts. 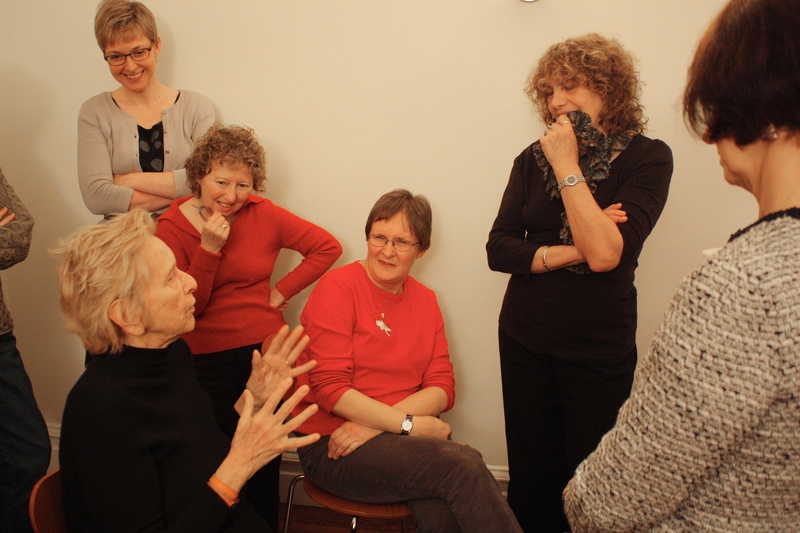 Working with all of you has meant so much, and has been such tremendous fun! 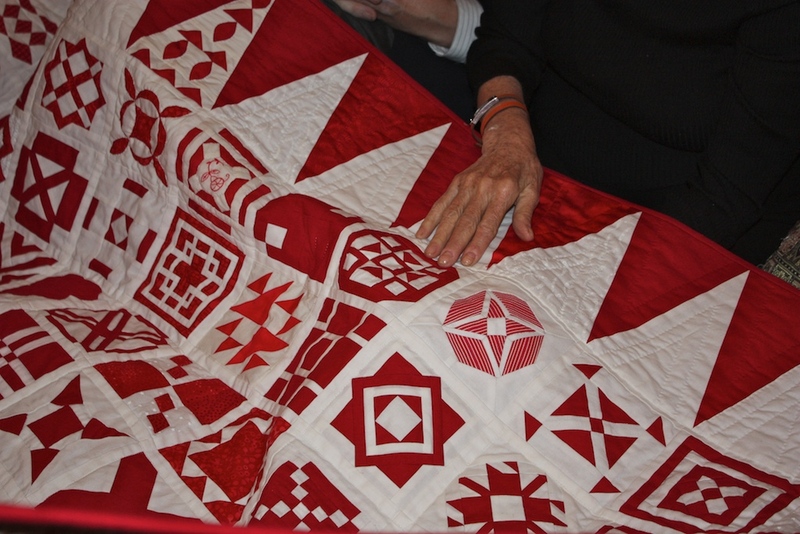 So, this afternoon we presented our quilt. It was exciting and fulfilling and everything we could have hoped for. That said, everyone chez nous is exhausted, so will post pictures tomorrow and hope you all have a good night’s sleep. In reality, I never expected to get beyond cutting and joining the binding strips this weekend, so I’m surprised to say that the quilt edge is trimmed…. Now to turn and blindstitch it to the back! 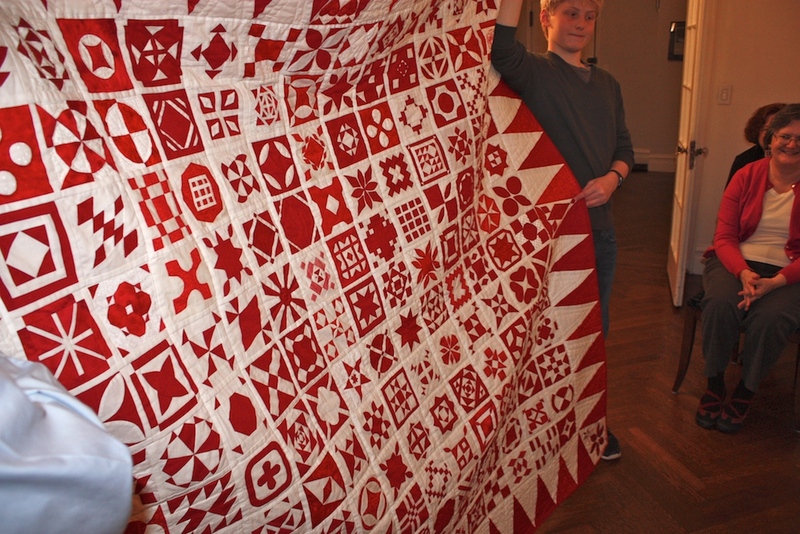 When I get a moment I’ll take and post some pictures of the gorgeous detail quilting done this weekend. 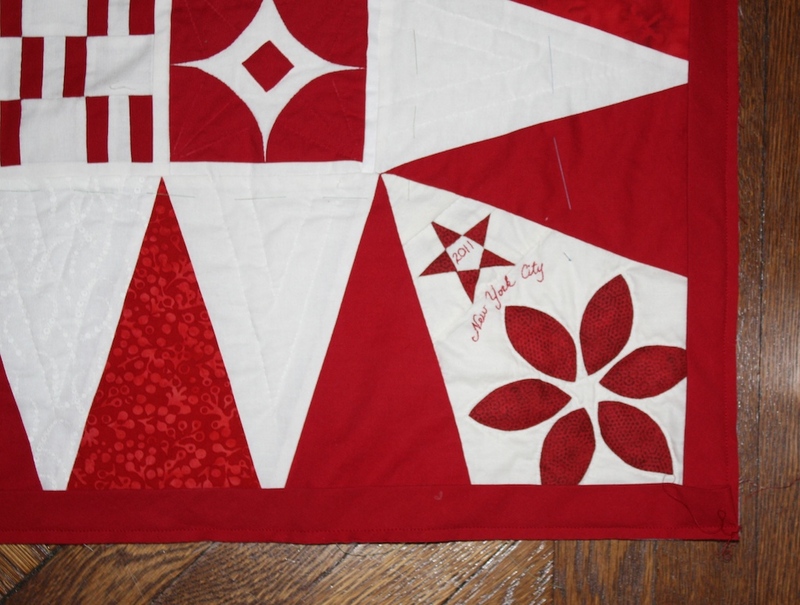 Rosebuds, fans, tic-tac-toe boards, and more now embellish our quilt! Have a great week everyone, and thanks so much for all your generous contributions! 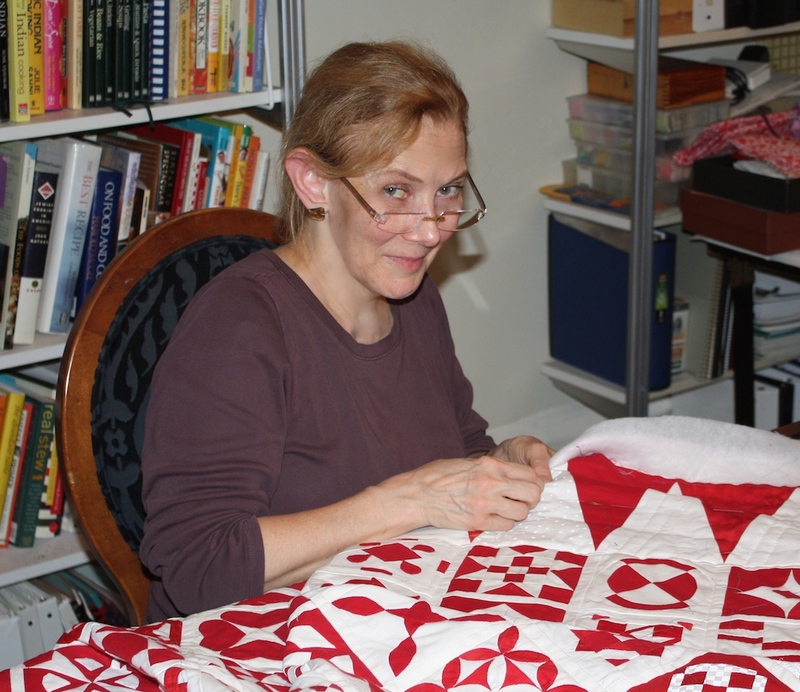 More quilting fun! 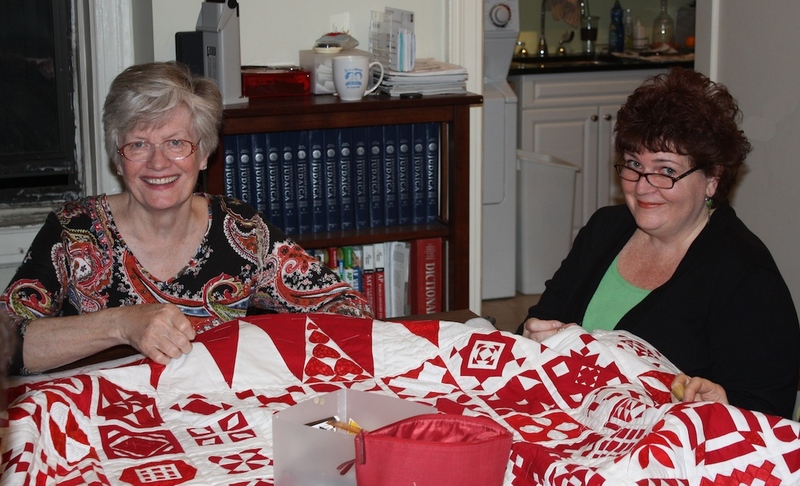 This week’s quilters: Judy Doenias, Diane Rode Schneck, Mary Cargill, Andrea Murray, Maureen Hyslop, Doreen Mangan, and Mom and me. 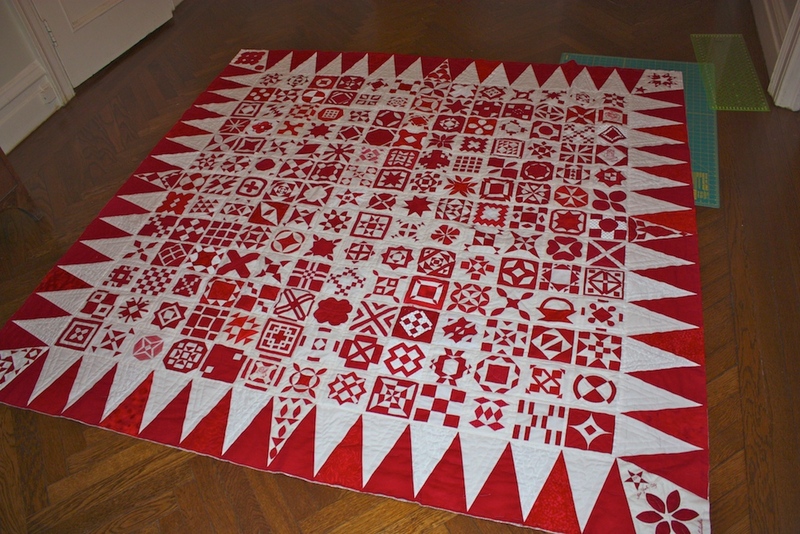 The white triangles are done, plus lots of quilting in and around the blocks. 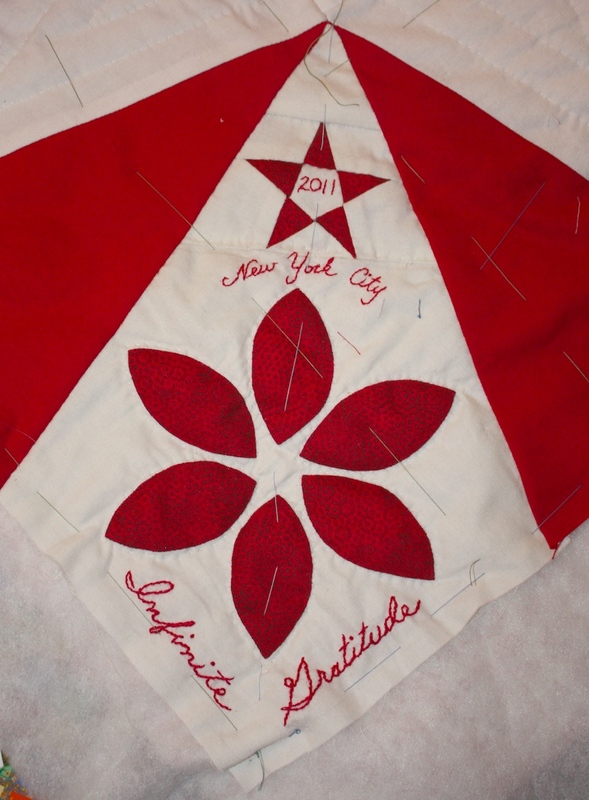 Now to put a single “v” in each of the red triangles, sew on the binding, and make a nifty label. We had such fun today! First Mary Cargill and Diane Rode Schneck came over. 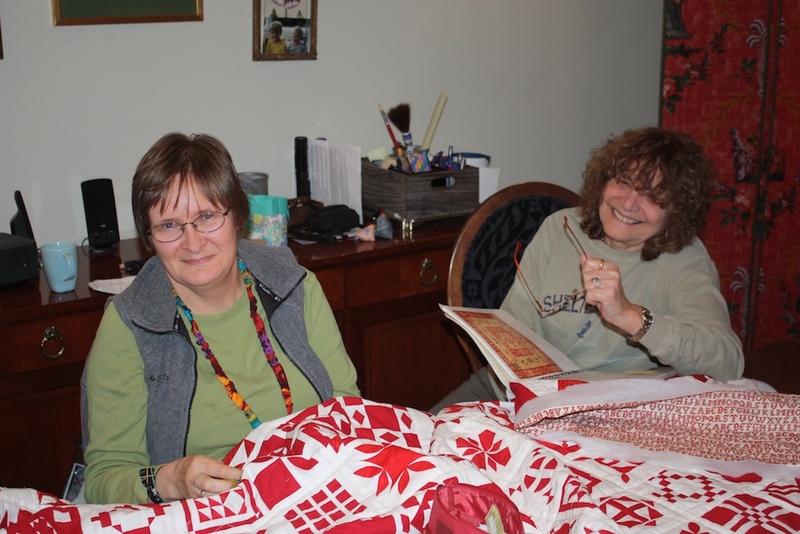 Then my mom, Nell Semel (with whom I have done every quilt I’ve ever finished) and Renee Fields stopped by and added several hours of stitching. 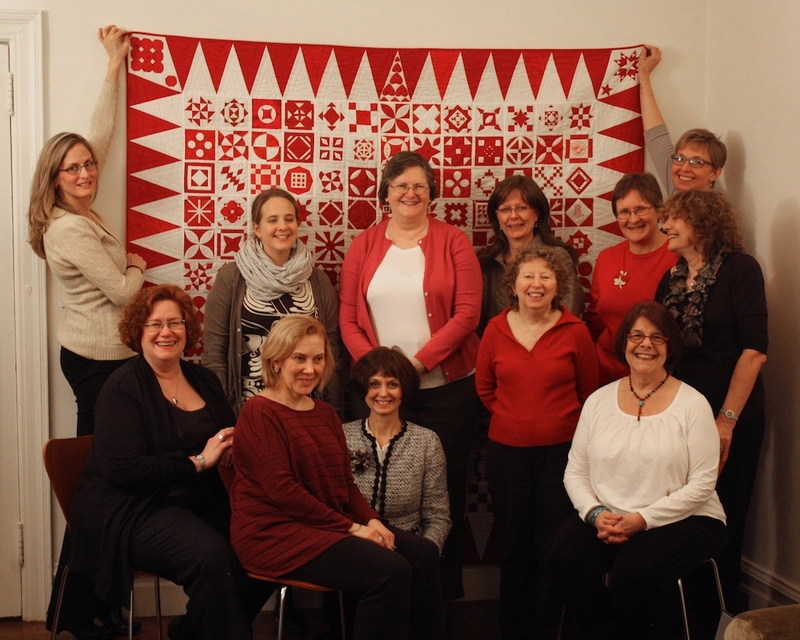 Andrea Murray and Barbara Sloane joined us later, and between the seven of us, we got quite a bit of quilting done! 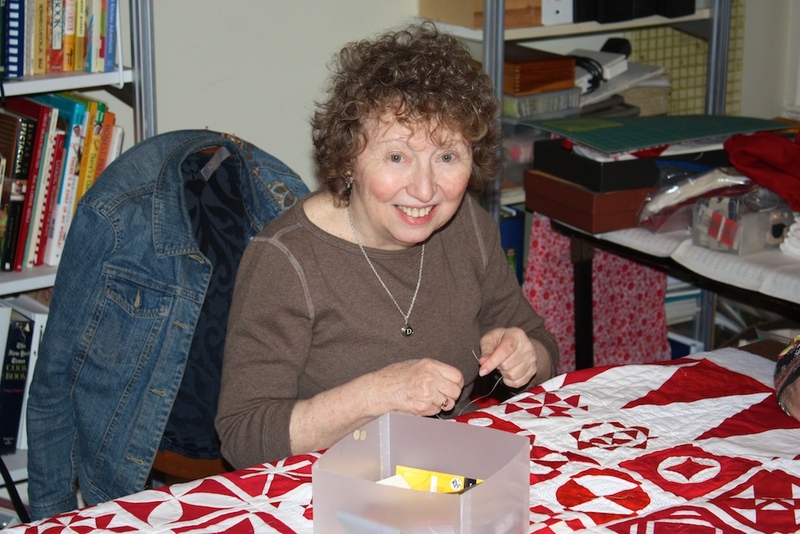 Still, there is plenty more to do, so we are going to quilt again next Saturday, and hope you can join us at some point. 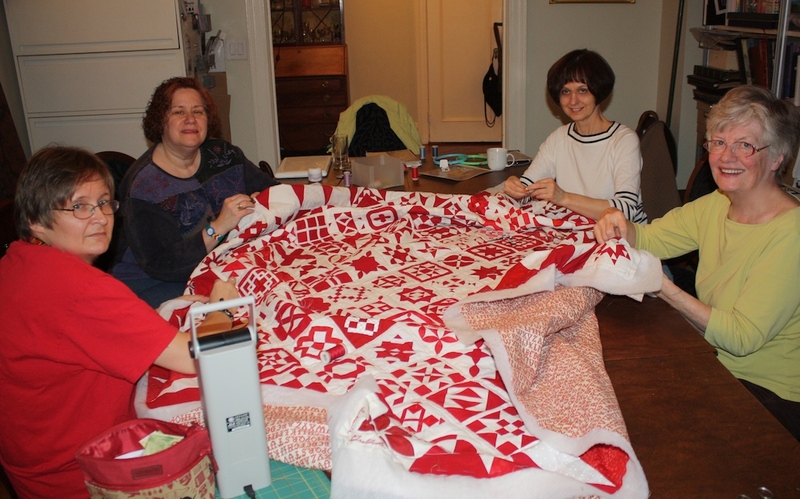 We’d love you to add a few stitches to the assembled quilt, which has a communal feeling quite different from that of piecing or appliqueing a block. Even if you only have a half hour to stop by and do a tiny bit, we’d love to have you join us. If Saturday isn’t convenient, let me know if there is an evening this week that would work. 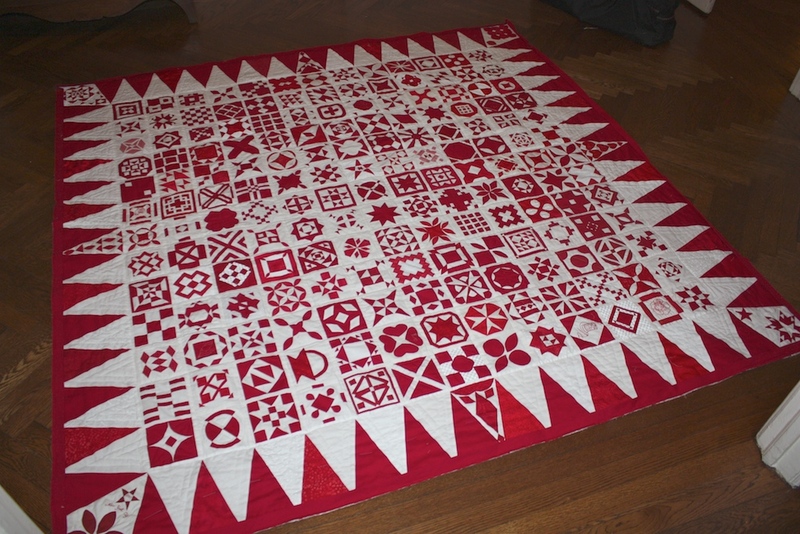 This is Diane’s lovely redwork embroidery on the bottom righthand kite. Just in case you are wondering if this is The-Project-That-Will-Never-End, we’re hoping to have this finished by the end of next weekend. Perhaps the hand-sewing of the binding will take another day or so beyond that, but we are wrapping it up in the immediate-near-future and will email you soon with plans for a culminating celebration! I’ve quilted half the columns in the ditch and the more I can do, the better it will look. Tomorrow I’ll lay it out on the dining room table and get some handquilting in. Please feel free to stop by and do some quilting on your block(s) or in some of the triangles – I think echo quilting in the solid triangle border would look lovely and add a nice drape to the edges. Hoping everyone is having a lovely Thanksgiving weekend!